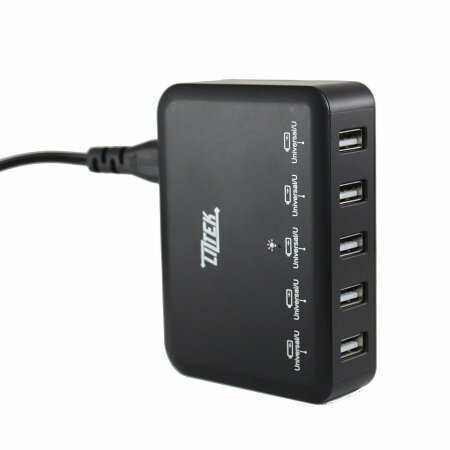 Liztek 40w 5-Port High Speed Multi-Port USB Charger is now available on Walmart. Fitted with Smart-Liz technology the device is ideal for charging multiple gadgets. It meets USB battery charging specifications BC 1.2 and supports fast charging . With progressing technological advances, all our gadgets are getting gradually compatible with USB charging. More and more battery efficient gadgets are being produced however the use of the gadgets has increased exponentially and hence we often run out of battery. To tackle this issue of charging multiple gadgets at the same time, Liztek has put its best foot forward. Liztek 40w 5-Port High Speed Multi-Port USB Charger Is an awesome product for those who want to save time on charging their multiple devices simultaneously. The device avails you five fast charging ports equipped with Smart-Liz technology. This allows all the ports to automatically adjust the power output to the optimal level by sensing the device being charged. Each of the port can give up to 2.4 Amp 5 volts output which is sufficient enough to charge even the high power gadgets like tabs etc. The Usb Charger is made up of premium quality circuitry which has got in built surge protection and over charge protection features. The device is made up of industry grade plastic and and is UL certified. It also meets up USB battery charging BC 1.2 specifications. All this makes the device as safe as effective. The Usb Charger is best for the use during travel as it accepts large voltage range input. Having five ports, the device can also be used by entire family. The device has been a best seller on Amazon and now It is all set to fetch the market even better with its availability on Walmart as well. So if you are a Walmart fan, you can still order the device on a click of a button. Your satisfaction is assured as the product comes with 100 percent money back guarantee.